Multifunctional Printers, Scanners, Wide Format, Scanning Software Solutions, Document Management Software Solutions, Print Management Software Solutions and Managed Services Solutions. • Exceed overall total revenue plan including hardware, software solutions and services. • Learn and adhere to the Sales Process that encompasses the entire process from delivering the value proposition to implementing the solution to performing scheduled account reviews. • Utilize an effective communication approach to converse naturally with business executives using professional business acumen. • Create and execute a plan to meet minimum weekly activity requirements for setting and completing appointments, performing account reviews, conducting assessments and creating executive summary recommendations. • Submit Daily work report, Weekly Performance Report and monthly sales forecast report. • Responding to tender briefing and feedback details. • Contributing to team or progress meetings to update and inform colleagues. • Meet or exceed your revenue and profit targets. • Grow year-over-year sales results. 1. Targeted prospecting activities to set appointments that include the use of social media, e-mail marketing, telemarketing, field visits and networking events. • Plan and implement strategies to market our office equipment and services to new and existing customers. 2. Conducting effective initial appointments that build the business case for managed services and performing an assessment. • Prepare sales proposal / quotation for submission to potential customers. 3. Perform a thorough assessment to uncover document process problems and create an executive summary that explains how we can solve. 4. Clearly present the findings of the executive summary and implement one of the solutions. • Responsible for agreement, contract and timely payment collection. 5. Follow up on an scheduled basis with clients by conducting a quarterly business review to discover additional areas that we can provide support and strengthen the relationship. • Organize and / or conduct product user training and demonstrations to the new and existing customers. • Handling hardware or software problems and faults and referring on to specialist technical colleagues. 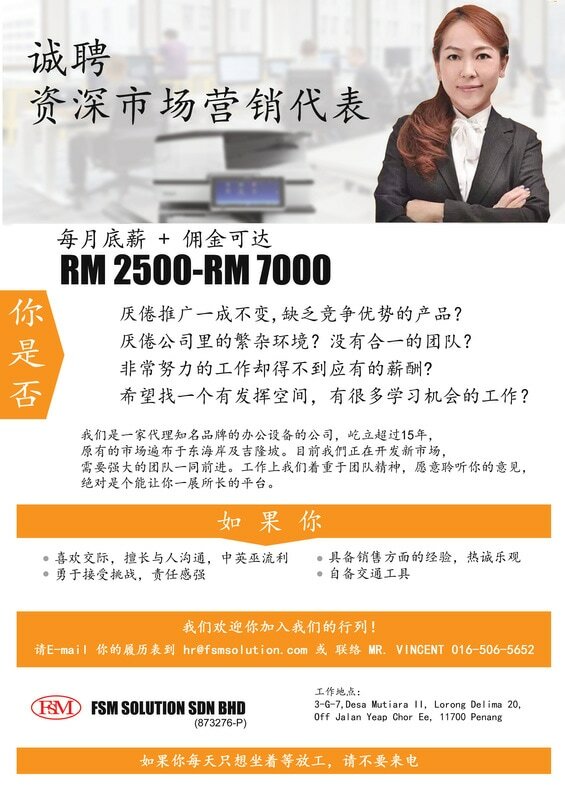 ​ * Based in Penang (Fresh graduates are encourage to apply). * SPM, 'O' Level or 'A' Levels candidates are encouraged to apply. * Must possess own car / motorcycle. * Able to work both independently and as a team under minimum supervision.